The small region of Oberlausitz in Saxony is the traditional home to the Sorbish, one of Germany's four "national minorities" with particular protections from the German government. (The others are Danes, Frisians, and Roma.) 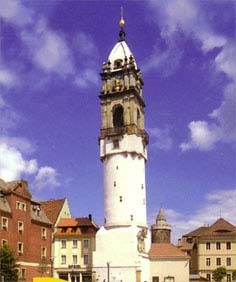 Bautzen is considered the cultural capital of this small (ca. 60,000) population, and it is a great little place. Unfortunately, your correspondent was on a very tight schedule, and could not spend the full time needed to appreciate this town. Nevertheless, it was fascinating to see. The signs in Oberlausitz are customarily bilingual; Sorbish appears to be a mix of Polish and Czech, and later in the trip a Polish friend of mine (who also speaks Czech) explained that the "sound" of the language strikes him as leaning toward Czech, but the grammar leans to Polish. Because of their minority status, they tended to be rather unenthusiastic about both the Nazis and the Communist East Germans, though with their relatively small number, it was difficult to put up a great deal of resistance. In any case, the town of Bautzen is home to Serbske Nowiny, published 5 days a week at a very reasonable € 0.30 per copy (pick one up next time you're in town), as well as a museum of Sorbish culture. While going through Bautzen, one must also climb the "Reichenturm," a disturbingly crooked structure which probably should have had a foundation deeper than the foot or so of earth that it was set in. At some point in the '60s, the East German government injected concrete down the center of the tower to hold it more-or-less in place, which causes a certain amount of inconvenience while ascending the tower, but at lest it's still possible to ascend, so that's alright. St. Peter's Cathedral is also particularly interesting; it is a "Simultankirche," used by Catholics and Protestants alike. There are two altars, two groupings of pews, and even two organs, yet under one roof. A small 3-foot-high fence-like barrier (open for tourists) runs through the church. Apparently, the two religious communities drew up an agreement hundreds of years ago about who uses what and when, and it has been in place ever since. In addition to this quiet town's interesting little churches and towers, however, a more somber, more monument to a more terrifying and less tolerant era can be found by walking east from the main square down Weigangstraße, where the East German Secret Police, the infamous Stasi, maintained one of their two largest prisons in the DDR. (The larger of the two is north of the main square.) Bautzen II is a prison that haunts. Its cramped cells and interrogation rooms, its bugged walls, its sick-green and ever-peeling-pale yellow paint jobs, all this testifies to the legacy of the DDR. The "diplomat's room," where foreign politicians came to inquire about the interned, has a low ceiling that cannot help but make one feel as though he himself will be crushed or broken by the unknown rooms above. The doors and bars squeak and grind. This is not a place to be re-educated. If you've made it here, there's no more you can be taught. Yet still (and this is to the museum's credit), still the human spirit is given the chance to triumph. The letters written on cigarette papers and snuck out in a pocket have been returned to the site of their conception, this time as as history, rather than hope. The corner cell where a single man once cleverly spooned through the wall and sprinted dashed ran for a noble 11 days shows the repair job, but the fact that it IS a repair proves that someone fought back. Stories of men and women who perished and men and women who survived press up against the walls, and we learn their stories too. It is tragic and unjust and appalling, and we owe them a debt of gratitude and honor for ennobling humanity by their ultimate victory -- and ours -- over Bautzen II.